Prysmian Group showcased new products specially designed for the oil and gas industry at the petroleum exhibition and conference Adipec 2015 which was held last month in Abu Dhabi. The Italy-based company focused on cable solutions that link the industry from top to bottom and incorporate complex and integrated power, control and instrumentation systems for chemical, petrochemical, power or industrial plants. The showcase included innovative solutions for offshore and on-shore applications such as Bostrig Type P cables; tailor made cable assemblies and accessories; enhanced service loops for drilling applications top drives and exclusive specialties such as Drylam and Airguard Cable Systems, specially designed for critical environments. To complete the available portfolio, SURF (Subsea Umbilicals, Risers and Flowlines) products – both steel and thermoplastic, as well as flexible pipes for offshore oil and gas extraction – and submarine cable solutions were on display. Prysmian Group recently received its first patent for its Bostdrive Cable Service Loops range of products, thus confirming the group’s leadership in product design innovation. Service loops are electrical, pneumatic, and hydraulic supply lines that provide service to a top drive drilling motor in oil and gas drilling applications and represent the top drive’s vital connection in any drilling rig, both onshore and offshore. Prysmian specialists have designed the Bostdrive families of top drive service loops and components by applying the extensive group’s manufacturing and technical expertise of similar applications such as elevators, robotics, mining and cranes, custom designed to each drilling operation’s needs and engineered to reduce or eliminate failures common with the hose-style loops standardly used on oil rigs for drilling. In addition, following the success of Airguard Cable Systems for medium voltage application, Prysmian’s Research & Development group has extended its capabilities in terms of mechanical, chemical and installation performance to low voltage cables and has introduced their new line of Low Voltage Airguard cables - designed for power, control, signal, and instrumentation applications in heavy industrial and offshore markets. Prysmian’s patented Airguard Polymeric layer provides far greater protection against water ingress and chemical attack than traditional armored cables. It also offers ease of installation, while providing superior mechanical and environmental protection, reduced installation costs in the field while improving the overall cable performance and increased installation personnel safety. The acquisition of Gulf Coast Downhole Technologies (GCDT) complements and strengthens the group’s presence and offer in the sector of downhole equipment for the O&G industry. The company asserted that Adipec 2015 came at a very important time for the group, following its recent acquisition of GCDT. It said GCDT fitted fully into the group’s expansion strategy in the SURF business and complemented its Draka-branded DHT product range. It added that the acquisition of GCDT allowed a further increased differentiation of the product offer, namely thanks to an enhanced portfolio of protectors and the patented Safety-Strip technology for faster and safer installation of intelligent completion systems. Based in Houston, GCDT is active in the design and supply of innovative downhole equipment for the oil and gas industry. GCDT products are installed in oil and gas wells around the world and consist of integral components in the systems that provide downhole control, injection, flow assurance and monitoring. Its customer base covers a diverse range of oil field service companies including Halliburton, Baker Hughes, Weatherford and Schlumberger. GCDT products are ultimately installed in completions operated by major oil and gas producers like ADMA, Adco, Zadco, Chevron, ExxonMobil, PDO, Shell and Saudi Aramco around the globe. 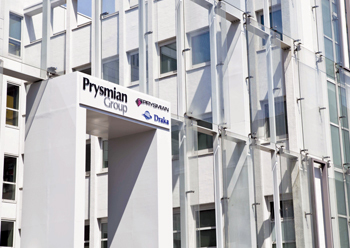 “Thanks to the integration between our SURF-DHT business and GCDT, Prysmian Group will be able to accelerate growth in an attractive high-value, high-ROCE (Return on Capital Employed) business and increase exposure to high-tech segments,” said Prysmian Group CEO Valerio Battista. “We also aim to improve customer proximity by leveraging our global footprint and bringing GCDT’s innovation capabilities to a broader customer base. Integration of the two brands is key for the development of an enhanced and versatile supply chain,” he adds. In the last years Prysmian Group has been continuously investing to expand its presence in the SURF business. Headquartered in Houston, the group’s SURF business can now count on new dedicated production facilities in Brazil and North America and on commercial offices in the Middle East, the Far East and Europe. Prysmian Group offers a wide range of products and services, including umbilicals, risers, flowlines and DHT (Downhole Technologies) perfectly integrated with the company’s core business of power and telecommunications cables. In the DHT business, the group is worldwide leader and supplies complete DHT solutions to all major players in the oil and gas industry. Prysmian Group’s Draka-branded DHT business can rely on state-of-the-art production facilities in Bridgewater, NJ and North Dighton, MA (USA) and a wide range of products including TEC (Tubing Encapsulated Cable) solutions, specialty tubing and specialty optical fibre-sensing cables.